As unpredictable the British weather is I am quite thankful to live somewhere that has such distinct seasons. As much as I loved making my summer style wishlist when Autumn and Winter roll around I am ready to cosy up in comfy knits and warm trousers. I love searching out the perfect bobble hat and the warmest scarf, new stylish winter boots and the perfect coat to see me through the colder months. Being a stay at home mum means that quite often I can get lazy about my wardrobe, thinking that no one will see me other than maybe the postman means it is easy to be tempted to wear my favourite pyjama bottoms all day. However, since Lucas has started school I do have to leave the house twice a day so it gives me a good excuse to look presentable, even though we do walk to school in all weathers. 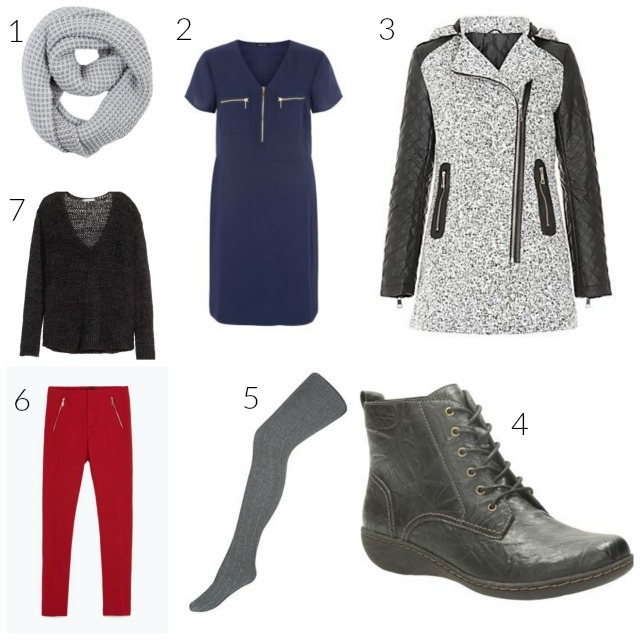 Here are some of my top picks for winter school run style – I’ve tried to go for a mix of practical and fashionable. I must admit that there are days on the walk to school when only a massive waterproof coat and wellies will do but then there are those perfect, sunny, winter days when you want to look stylish while being wrapped up warm from head to toe. As I get older I am trying to keep the words ‘capsule wardrobe’ in my head whenever I shop. I am always on the look out for clothes and shoes that can make a few different outfits. I’d rather pay a little more for something that is good quality and will go with everything. A scarf is top of my list as the colder weather comes around, I buy a new one (or two) each year as I think you can never have too many. The navy tunic from New Look is such a lovely colour and would go great with the grey tights just as well as it would with leggings or jeggings. The big winter coat from New Look and the leather boots from Brantano are my practical picks – I love the style of the coat and this fact it has a big hood for those days I’m caught in a freak rain shower. The boots are just perfect for me, I would wear them with dresses, trousers, leggings, jeans and they look like they would serve me well in all weathers – I hate having cold feet! I just had to add a bit of colour with the red skinny jeans from Zara alongside the knitted jumper from H&M that could be dressed up or down. What about you, what do you love about winter fashion? This post was written in collaboration with Brantano. I really really like that navy tunic from New Look, I never think to look there. I love New Look, their dresses are always so reasonable. They have a great range!